Fabric Crayons make a nice dyeing project for children. The crayons are made of disperse dye—don't confuse them with the ordinary wax crayons that they so closely resemble! You CANNOT do this project with regular crayons. Disperse dye works well on synthetic fibers, such as polyester, nylon, acrylic, or acetate. It does not work at all on natural fibers such as cotton, silk, or wool, nor on reprocessed cellulose fibers such as rayon, Tencel (lyocell), or bamboo. An ideal material is a white 100% polyester in a smooth satin weave. Make iron-on transfers by drawing on paper with special fabric crayons! For use on synthetic fabrics only. Start with any clean white paper. Ruled notebook paper is fine. It's best to color fairly heavily, brushing off any crumbs. You can mix colors by using more than one crayons in one place. The colors will look quite dull on the paper, but don't worry. They will look brighter in your final results. 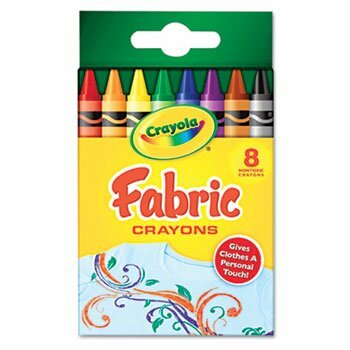 You'll need a hot dry iron to transfer the fabric crayon from the paper to the fabric. Use several layers of newspaper, topped with plain white paper, as a pad to protect your ironing board. Lay the design you've colored face-down on the fabric you've chosen, and place another sheet of paper on top, to protect your iron. Empty any water out of your steam iron before starting, and use a cotton setting. Be careful not to shift the paper as you iron, as this will blur your results. You can easily recolor your original design, and iron it onto another section of your fabric, for a repeated motif. Your fabric can be machine-washed in warm water, but the package warns against using the dryer.